What if You Could Reset Everything? The big question driving Episode EF2 is… What if you could reset everything? Not often do you get a chance to make a complete reset of everything – the good and the bad. So if an opportunity came along that allowed you to completely reset your life and start all over again – would you do it? At the end of the day, when you sum up everything your current life is – would a complete reset come as a blessing or a curse? Let’s take it a step further. While you’re restarting your life some might call insignificant, what if you could take the rest of the World for the ride with you? All the way back to the very start – big bang or whatever the beginning might be. Again, would you do it? It’s highly unlikely you or anyone else will ever get this opportunity. But, although you won’t get the chance to reset with a press of a button, you can “hack” your way to what you want or need. You already got the computer, now you need to figure out the password. Same as every day, you’ll wake up faced with the ability to take several high-stakes gambles—change the world, change yourself or do nothing—three core options that are always right at your fingertips. The problem is you’re most likely on auto-pilot and not consciously aware of this potential you have each day. So instead, you will probably take another step into the comfortable yet dark cave of dissatisfaction; it’s safe, but also tightly shut with a limited supply of air. But what if things were different? What if all it took to make a major change in your life was a simple push of a button? Would you do it knowing a simple motion could change everything, at the cost that it might also plunge you into the great unknown? What does it take to make such a broad yet straightforward action…bravery, or despair? 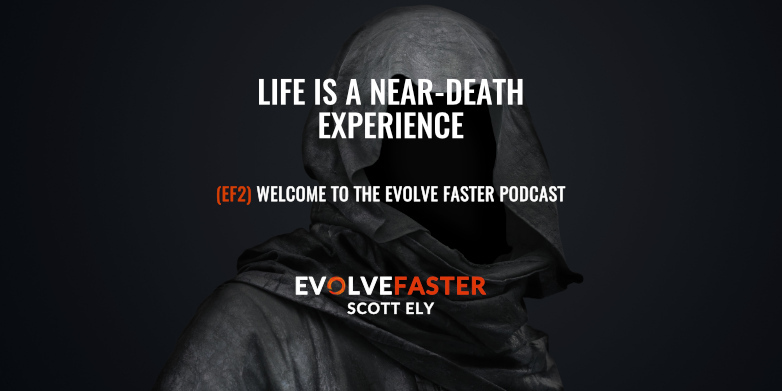 In this introduction to the Evolve Faster Podcast, we’ll ride an hour-long roller coaster of a thought experiment designed to challenge your normal modes of conscious life experience. We’ll look at a psychological tendency that makes it difficult for you to break out of the mental auto-pilot in which you rarely acknowledge the fact that you could die around the next curve. Next, we’ll investigate what it means to Evolve Faster as a metaphor for personal and societal change. 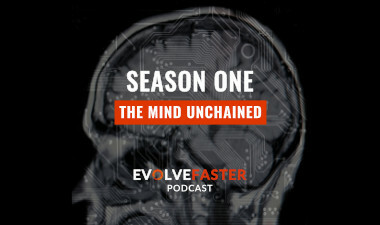 Finally, we’ll examine where the podcast will go from here into the regular seasons–groups of 10 (or so) themed episodes, written and produced in a unique fiction-meets-nonfiction format. So buckle your philosophical seatbelt, pull down your psychological shoulder harness and lock up your kids (ok, don’t do that). 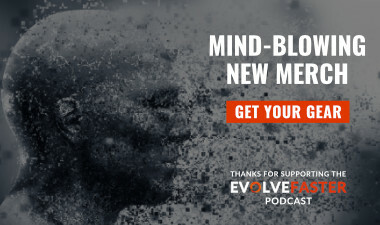 Hope you’re ready to see how well your stomach can handle this existential joyride of exploring some of the foundational content for the podcast. 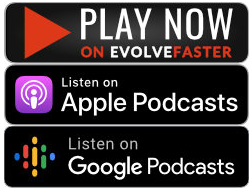 The other goal is to prepare us for the upcoming Season One of the Evolve Faster Podcast. SHOW NOTES: This episode is dedicated to George Carlin. See the EF2 Show Notes for details of the dedication, inspirations, references, selected quotes and more. Get notified as soon as this episode is released. 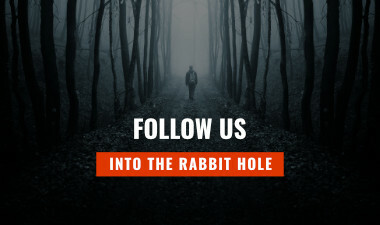 Following us on social media is great, but they filter what content you get to see. Email is the only sure way to get notified.